Lindenwood University is committed to the development of the whole person within a value system that acknowledges the university’s Christian heritage and focuses on four-dimensional personal growth: mental, social, physical and spiritual. Student Life & Diversity helps students to establish good learning skills; gain a broad range of knowledge and understanding about the arts, humanities and sciences; obtain social and physical enjoyment through athletic and recreational activities and special events; grow in capacity for work, achievement and leadership; and experience self-discovery and personal fulfillment that will serve a lifetime. The University Community seeks to foster peace and harmony by maintaining order and stability. Policies and rules help to establish order and serve the common good. The Lindenwood University Community is a voluntary society that asks you as its member to possess a loyalty to the institution and personal commitment to growth, education and the community. Welcome to Lindenwood University! As a member of the university community, you will have many opportunities to develop your skills and abilities, interact within our diverse community, and engage in learning through our academic and co-curricular programs. Please make every effort to get involved and connect with your fellow students, the faculty, and staff. The more you invest in the university and its opportunities, the more successful and rewarding your learning experience will be. 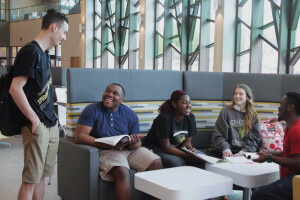 Student Life & Diversity is part of Academic Affairs, which reflects the commitment Lindenwood University has to each student gaining “real experiences” and having “real success”. Our staff intentionally promotes student learning and provides high-quality programs and events. Student truly are first in everything we do because we are all student advocates. The following offices and programs are housed in Student Life & Diversity –Dean of Students, Diversity, Greek Life, Immunizations, Intramurals, Recreation Center, Residential Life, Student Involvement, Lindenwood Student Government, and the Wellness Center: Student Counseling and Health Center. We seek to maintain a safe and stable campus community, thus you may be interested in the following resources: Student Handbook, Title IX Policy, Student Right to Know & Campus Security Report, and Guide to a Drug Free Campus. Should you have a question, concern, or comment, please do not hesitate to contact any staff member in Student Life & Diversity.